Discussion in 'General Discussion' started by nightblighter, Feb 4, 2019. I wonder how much of an effect having a clan like "NEW" in the game would benefit new player retention. I know a lot of bigger clans (and quite a few smaller clans) are very open to taking in new players and teaching them the reigns of the game, but I am curious as to how many new players get lost in the crowd. It's crazy hard (if not near impossible) to juggle running a big clan while also worrying about villages and sieges while also finding time to teach new players the game. Something has got to give. A few clans have attempted a NEW-like atmosphere, but none have really matched what NEW was: an actually neutral third-party that did not take sides and existed solely for the purpose of teaching new players the game. New players would come in, spend some time with the clan, then "graduate" and move on to other clans. A few stayed on as "counselors" after graduation, like I did. I don't know how feasible a remade NEW would be these days, in terms of population and the like (and if a NEW-like clan would actually be the best option for new players in RoA's climate), but I know for certain that I would not have continued playing were it not for NEW. The counselors there really took it upon themselves to teach you not just how to play the game, but how to love the game. Maybe that's what we're missing. HaldirHardy and Fengor like this. I think having a guild dedicated to helping new players helps, the only issue is keeping it active. I remember darkfall university was around when I started in RoA, but it quickly became obselete and inactive. Imo it makes more sense for active clans to take it upon themselves to recruit and teach new players rather than relying on certain people to selflessly devote time to teaching players who ultimately move on. Blaze and Fengor like this. Brando Pando and Mea Kulpa like this. Not the only issue, having a good leader is so important. The last clan that was supposed to be about new players failed to teach a lot of new players about the little things in the game that will save they're lives and make life much simpler. Just making a clan for new players does nothing if they are not taught the game on every level. Nice. Did you count kills and ganks if the person doing it and person getting it were same clan? Defiance also ganks the largest percentage of its own base. 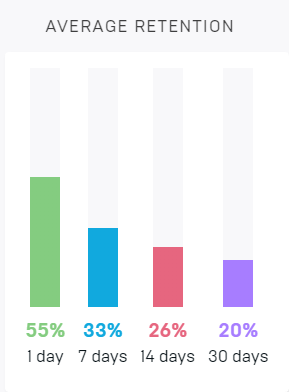 Here's some more fun statistics, this is the retention percentage for new players during this period. We can see from this that we lose 55% of new players on their first day. This is about average for most games but obviously it's something we would like to improve as much as possible. But we can also see that players that make it through the first week are very likely to keep playing. 20% retention after 30 days is pretty decent, so if we can improve the first week of game-play and get more new players trying the game, we should see constant growth like we have been seeing through the free period. Do you know within each of the 20% who stay and the 80% who don't, how many participated in PvP of any sort and how many joined a clan or party? The last statistics we got from EVE online is that they only had 10% long term retention, but people who joined corps or participated in the sandboxy parts were the ones who stayed, and the people who just did NPC missions left. So I'm always hungry for more data of that nature. Fengor, DeadlyHit and Frog like this. Johhny Mad Dog, Brando Pando, Blaze and 1 other person like this.